Should Titans grab the Actium War Rig in Destiny 2? 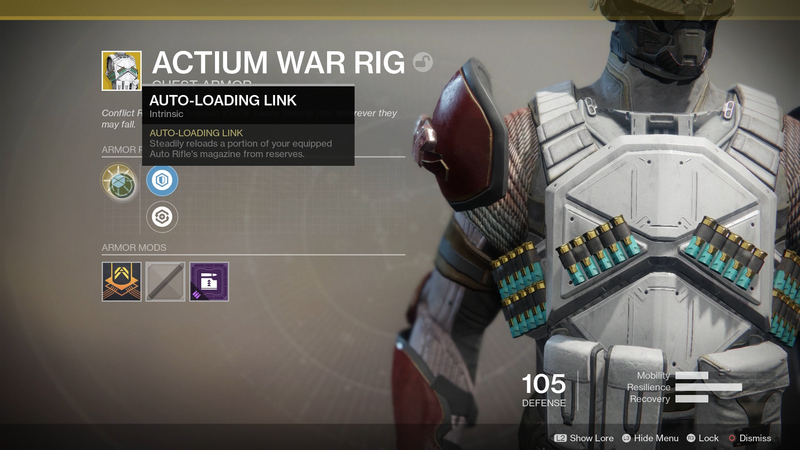 The Actium War Rig is a new Titan Exotic in Destiny 2. Without revealing too much in the way of spoilers, you will have a chance to grab the Actium War Rig very early on in the Destiny 2 campaign. Should you pick the Actium War Rig? We’ll let you know if this Titan Exotic Chest piece is worth your time in Destiny 2. 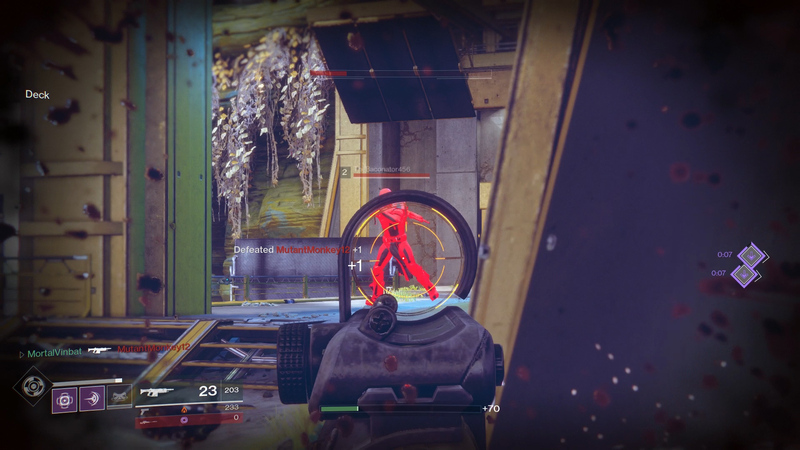 Auto-loading Link steadily reloads your auto rifle’s magazine from the reserves. It is not unlimited since it comes from the reserves, and it is possible to run out if you fire faster than the clip refills. Auto-loading link will add 4 bullets to your magazine every second. This is a powerful perk that will have Auto rifle users firing for long periods of time without reloading. Destiny 2 emphasizes team firing and avoiding multiple engagements at once. While the Actium War Rig does not completely change this, it certainly helps out in situations where you cannot avoid multiple enemies. During our testing, there were multiple times where we could strafe around incoming fire, then finish the kill while the enemy reloaded. 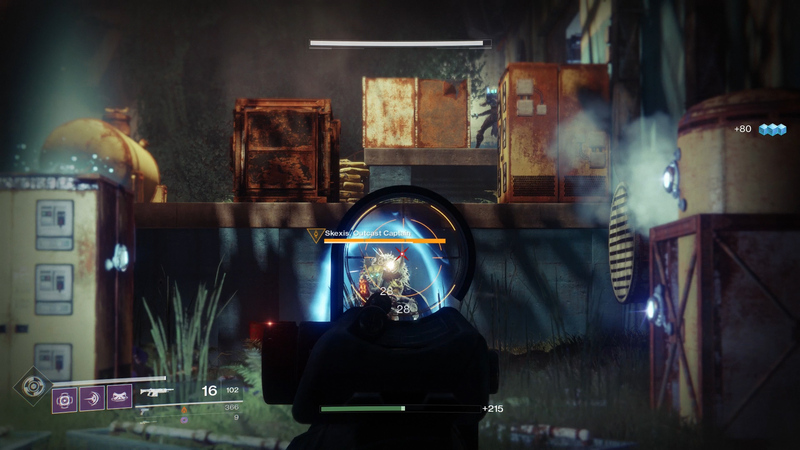 Also helpful was laying a consistent suppressive stream on the enemy, destroying Titan barriers or allowing teammates to clean up half-healthed Guardians. The Auto-loading link also reloads when you aren’t firing, so having your magazine fill up as you ADS down a choke point after a gun fight is valuable. It is hard to recommend the Actium War Rig for PvP to everyone, since its Exotic perk only works with auto rifles. If you don’t like using autos in PvP, there is no use for the Actium War Rig for you. There might be better options out there for PvP Titans who love autos, but none of those options are available to pick instead of the Actium War Rig after the campaign mission. For that reason, we recommend picking up the Actium War Rig – but only if you like auto rifles. There are a lot more situations in PvE where you have to fire on multiple enemies, making the Actium War Rig a very strong choice. This chest piece will help you mow down ads, or deal high DPS to bosses. Hordes of Thrall are no longer an issue, as you can hold down the trigger and steadily mow them down. Once again, if you are an auto rifle user, the Actium War Rig should be your go to Exotic in the early stages of Destiny 2. Destiny 2 is a game of primary weapons now, and the Actium War Rig makes autos very strong. If you are an auto user, we recommend picking up the Actium War Rig in Destiny 2.